There are myriad differences between east and west. The people, the politics, the sense of scale. I find both sides compelling in their own way. I've often proclaimed that I have an eastern sensibility and a western soul, which is why I've ponged between east and west throughout my adult life. Last week I journeyed from San Francisco to Phoenix and back. It was a familiar trip in many ways; I've crisscrossed the hardscrabble moonscape of southeastern California too many times to count. But this time I was seeing things as a photographer, and the differences between the coasts never seemed more stark. My travels back east were marked by a wealth of blue roads and continuous interplay with the kind of towns Norman Rockwell made famous. But out here, in the most forbidding stretches of the west, the sparse population left me with few routes from which to choose--and nearly all of them were interstates. Score one for the east. Bent on finding photographic fodder, I wandered far off my route to pick up a stretch of old Route 66. Most of 66 was as desolate and unpeopled as the interstate, but I did at last encounter a setting unique to the west: a hot, fetid auto graveyard, a final home for vehicles burned up or burned out. It was an eerie place, even in the middle of the day. It smelled of old charred hamburgers, and the flies, delirious to find human company, dutifully followed me around the place. 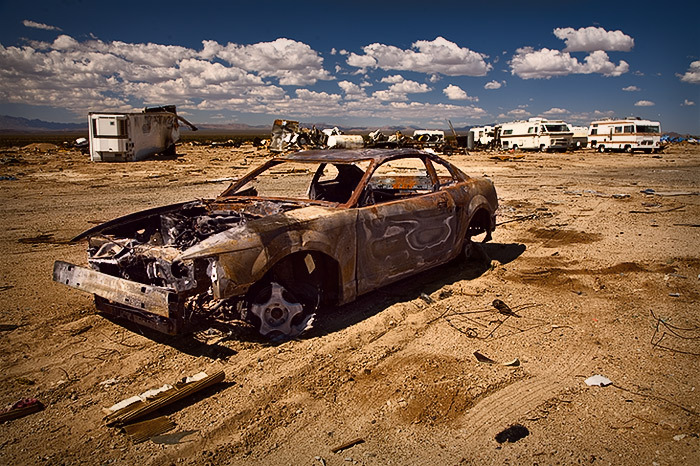 I got goosebumps as I studied the burnt shells of long-forgotten cars and speculated as to their end. Did they take flame in an insurance scam? Or did they meet with a more tragic demise, taking with them some unlucky fellow whose seat belt jammed at the wrong moment? There were no names, no epitaphs, no dates to mark comings and goings. But this was a graveyard, all right. And a graveyard far more poignant the ones I've seen back east. Score one for the west.